For all of its craziness and scariness, the 2016 election campaign has hammered home for millions of Americans the degree to which massive inequities permeate our daily lives and threaten our democracy. Unfortunately, understanding how inequalities affect us has yet to permeate the education policy world. While the transition from narrow, punitive No Child Left Behind Act to the Every Student Succeeds Act represents real progress, there is still a widespread belief that schools are the main drivers of achievement gaps and that they can, and should, be responsible for closing them. Correcting this fallacy is critical to getting the education system we need – one that is both equitable and excellent – and will help correct some of those larger inequities as well. In reality, the same systemic forces that have sucked most of the income and wealth from the bottom half of our population in recent decades and channeled it into the top one percent have substantially widened income-based achievement gaps. Without intentional measures to direct a broad range of educational and other resources to reversing that trend, gaps will continue to grow. And because big disparities in parents’ – and society’s – investments in children begin at birth, those resources need to be channeled early. Many of us know that students from poor families, and especially low-income students of color, are often two to three years behind by the time they begin high school. What is far less widely known is that those same students began school that far behind. In other words, our highly inequitable school system, which consigns students with the greatest deficits to the least credentialed and experienced teachers, is doing more to maintain gaps that children brought with them on their first day of kindergarten than to create them. A study by my colleague, Emma Garcia, finds that, in fact, students in the bottom social class quintile lagged their highest-social class peers by a full standard deviation in both reading and math at kindergarten entry. Those same students were about half a standard deviation behind on such social emotional skills as persistence, self-control, and social interactions, which are equally critical to academic, and life, success. Mind you, education researchers typically translate that “standard deviation” into two or three years of schooling. Let that sink in: one in five students start kindergarten one to three years behind, whether behaviorally or academically. When we looked across racial groups, the gaps were smaller, and could be explained substantially by social class. Given that nearly half of black five-year-olds who started school in 2010-11, and almost two thirds of English-Language Learner Hispanic children, versus just 13 percent of their white peers, are living in poverty, however, shifting the comparison groups doesn’t improve those students’ real life contexts. Schools didn’t start these problems. And the evidence tells us that schools alone can’t fix them. Early fixes that will work. Luckily, there is also some very good news on this front. Unlike fixes for our bigger, broader societal inequities, strategies for closing these early childhood gaps are well understood, extensively documented, and, miraculously, have fairly wide support across the political spectrum. A paper just published by five EPI researchers lays out both the multiple societal problems created by our failure to make the needed public investments in quality early child care and education, and the broad set of benefits to be reaped from righting that wrong. First and foremost, an ambitious national investment in early childhood care and education would help get all our children to the starting gate in much better shape. 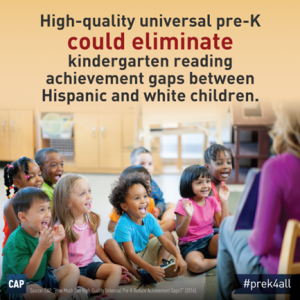 Another recent study, conducted jointly by the National Institute for Early Education Research and the Center for American Progress, suggests that universal pre-k alone would narrow math gaps by between 45 percent and 78 percent (black- white and Hispanic-white gaps, respectively) and virtually eliminate pre-kindergarten reading gaps. But the benefits to the investments we propose extend much further. Ensuring a living wage for child care providers would not only improve their quality of life and enhance their contributions to the economy, but help stabilize the workforce and, ultimately, benefit the children they care for. Because child care is such a burden for young families – as expensive as rent or more so in many cases – making high-quality child care available would provide a benefit of about $11,000 annually for Florida families with an infant and a preschool-aged child who are earning the state median income. And removing this barrier to women’s workforce participation would help bring American women in line with their international peers, with potential gains to the gross domestic product of as much as $600 billion annually. As the election comes closer, we must continue to push all candidates in both parties to focus on the severe problems working Americans face. Let’s make the early childhood investments we suggest front and center. By our analysis they are low hanging fruit—politically and economically. Elaine Weiss is the National Coordinator for the Broader Bolder Approach to Education, where she works with four co-chairs, a high-level Advisory Board, and multiple coalition partners to promote a comprehensive, evidence-based set of policies to allow all children to thrive in school and life. Major publications for BBA include case studies of diverse communities across the country that employ comprehensive approaches to education. She has also authored two studies with EPI economist Emma Garcia on early achievement gaps and strategies to reduce them.